This article is about the freshwater fish used for treating skin diseases, notably in Kangal district in Turkey. The name doctor fish (a.k.a. nibble fish, kangal fish, and doctorfishen) is given to two species of fish (Garra rufa and Cyprinion macrostomus). They live and breed in outdoor pools of some Turkish spas, where they feed on the skin of patients with psoriasis. The fish consumes the affected and dead areas of the skin, leaving the healthy skin to grow. Treatments at spa may not cure completely but help symptoms to subside, although some patients have experienced a complete cure after repeated treatments. Japanese spas are also cultivating and raising the doctor fish for business and some spas are operating for fun, too. Are you interested in the business? It looks and sounds good, isn't it? 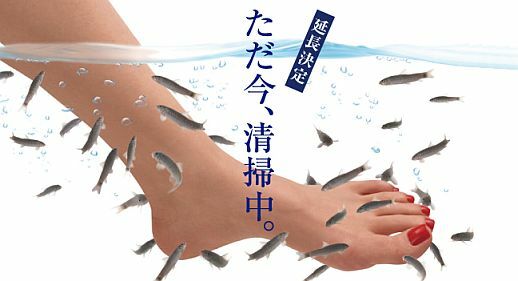 According to the "Doctor Fish Japan Limited" of Tokyo, Japan, about 15 minutes of bathing and 5–6 times a day, 150–200 fishes for one person, and water temperature of about 32–37°C is recommended. 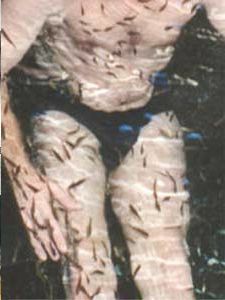 In fact, since the beginning of 2006, several spas had opened a business with doctor fish in Japanese resort area. How about you?